It's the all-time favorite Malaysian crispy Indian style pancake server with curry chicken potato dipping sauce. A traditional Indian pancake filled with egg. onion and green chilies server with curry chicken potato sauce. 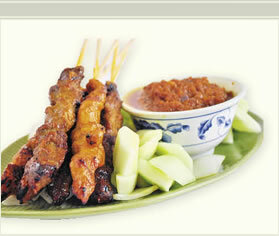 Marinated beef or chicken grilled on skewers served with peanut sauce. Crispy fried tofu stuffed with cucumber and bean sprouts with peanut sauce. Crispy fried baby squid with honey sauce. Fried chicken wings wrapped in screw pine (pandan) leaves with spicy dipping sauce. Minced pork and shrimp wonton with homemade spicy dipping sauce. Deep fried rolls stuffed with cabbage, beanthread, carrot and shrimp served with plum sauce. Sauteed sliced of chicken with lemongrass served with peanut sauce and fresh lettuce. Combination of Chicken, shrimp, Vegetable. Pastry dough stuffed with chicken, onion, potato and curry powder. Steamed or pan fried dumplings with shrimp or vegetable in special chef's ginger vinegar. Thai famous spicy and lemongrass soup. Seaweed and tofu in delicate chicken ginger stock. Salted cabbage, fish head, ginger in fish broth. Lettuce, tomatoes, cucumber, tofu and boiled egg with peanut sauce. String of pickled raw papaya and tomatoes topped with crushed peanut. Shredded mango, pepper, onion with Thai sweet and spicy spicy sauce. sliced roasted duck with pineapple, cashew nut, onion, chili & mix green. Malay famous noodles served in chef's special shrimp broth with shrimp, Pork and bean sprouts. Rice noodle served in fish broth with fish head and salted cabbage. Yellow egg noodles, bean sprouts served in coconut curry broth. Rice noodles served in spicy and sour lemongrass broth with seafood and straw mushroom. Thin flat noodles in chicken broth with shredded chicken or shrimp. Special egg Noodles served with wonton in homemade sauce of chicken broth. Pearl noodles with minced shrimp, pork, egg and bean sprouts in a clay pot. Homestyle crispy noodles with vegetables, pork, shrimp and squid with egg gravy in a clay pot. Malay‘s famous stir-fried thin flat noodles with shrimp, squid, bean sprouts, eggs, soy sauce and chili paste. Flat noodles with seafood, choy sum in tasty egg gravy sauce. Our version of Pad Thai. The satisfying thin-flat-noodles dish from Thailand, is made with tofu, bean sprouts and top with crushed peanut. Flat noodles with onion, Chinese broccoli, chili and basil leaves. Stir-fried rice vermicelli with tofu, shrimp, beans sprouts in spicy Thai chili sauce with hardboiled egg and peanut on top. Indian style yellow egg noodles in an authentic mild homemade sauce with shrimp, tofu, potatoes, egg and bean sprouts. Singapore style stir-fried rice noodles in special mild sauce with shrimp, bean sprouts, egg and lettuce. Stri-fried flat noodles in special sauce with beef, scallion and bean sprouts. Pearl noodles with shrimp, Chicken, egg, scallion and bean sprouts. Noodles in Malaysian soy sauce with shrimp, chicken and pork. Stir-fried rice noodles with salted fish, chicken, vegetables and bean sprouts. Steamed chicken (room temperature) with chef's special soy sauce. coconut flavored rice with screw pine leaves. served with chili anchovy, curry chicken and hard boiled eggs. Fried rice with shrimp, chicken and pork with vegetables. Fried coconut rice with shrimp, carrots, string beans topped with cucumber and boiled egg. Fried rice with shrimp, cashew nuts, fresh pepper, egg in shrimp paste. Aromatic curry infused with chili paste, ground onion and lemongrass. Sliced ginger, Scallions in brown sauce. Chinese broccoli or American broccoli in brown sauce. Green pepper in bean paste. Formed fried taro filled with shrimp, chicken, baby corn, snow peas and black mushrooms topped with cashew nuts. Homemade tofu with Chinese mushrooms, snow peas and scallop in lobster sauce. Steamed chicken (room temperture) with chef's special soy sauce. Deep fried white meat chicken with fresh chili curry leaves, onion and delicate oriental spices. White meat chicken with curry leaves, onion, Chili paste and traditional spices. Half crispy roasted duck served in Hoision plum sauce. Eggplant cooked with salted fish and chicken in a chef's special sauce. Deep fried spareribs in an authentic style. Pepper, onion and chili in a tasty Thai basil sauce. Eggplant, pepper, bamboo shoots, basil and lime leaves in a spicy coconut curry broth. Quick fried white meat chicken sauteed with sesame seeds and brown sweet and sour sauce. Sauteed chicken with lemongrass, pepper, tumeric and chili. Mixture of Vegetable with Chinese mushrooms in light garlic sauce. Tiny dried shrimp, fresh chili and garlic. Malaysian pickled, fresh chili and tiny dried shrimp. Deep fried bean curd with minced pork, Pepper and basil leaves in chef's special sauce. Tofu with minced pork, shrimp and Chinese mushrooms in chef's special spicy sauce. (Red Snapper / Flounder / Sea Bass) pungent spicy shrimp paste sauce. (Red Snapper / Flounder / Sea Bass) Deep fried fish with onion in black bean sauce. Spicy curry sauce with curry leaves. Sauteed with tiny dried shrimp, lemongrass, curry leaves & chili. Butter flied jumbo shrimp fried in a coconut batter. Jumbo shrimp cooked in a blend of fresh herbs, onion, green peppers. Sauteed seafood combination with lemongrass, onion, asparagus, lime leaves and homemade chili sauce. Shrimp, scallop, squid with green pepper in a black pepper sauce. with Minced shrimp, chicken, brown sauce. All orders served with soup of the day and steamed jasmine rice. Noodle dishes do not come with rice. No substitutions please. Sauteed slices of chicken with lemongrass served with peanut sauce and fresh lettuce. Sauteed mixed vegetables and glass noodles in light garlic sauce. Chef's special fried coconut rice with string beans and cabbage topped with cucumbers and hard boiled egg. Our version of this satisfying thin flat noodle dish from Thailand is cooked with tofu and bean sprouts topped with crushed peanut. Sauteed with sliced ginger and scallion in brown sauce. Fresh Basil leaves , pepper, onion, chili in a tasty Thai basil sauce. Eggplant, bell peppers, bamboo shoots and basil cooked in spicy coconut green curry broth. Sauteed shrimp with onions and pepper in spicy Malaysian shrimp paste. Sauteed shrimp with asparagus in spicy Malaysian shrimp paste. Seafood combination with lemon grass sauteed with onion, asparagus, lime leaves and homemade chili paste. Fried fillet sauteed with pineapple and peppers in s mild sweet and sour sauce. Penang famous crispy pancake stuffed with ground peanuts. Black sticky rice with coconut milk. Shaved ice with red bean, corn, palm seeds, jelly, red rose syrup and coconut milk.